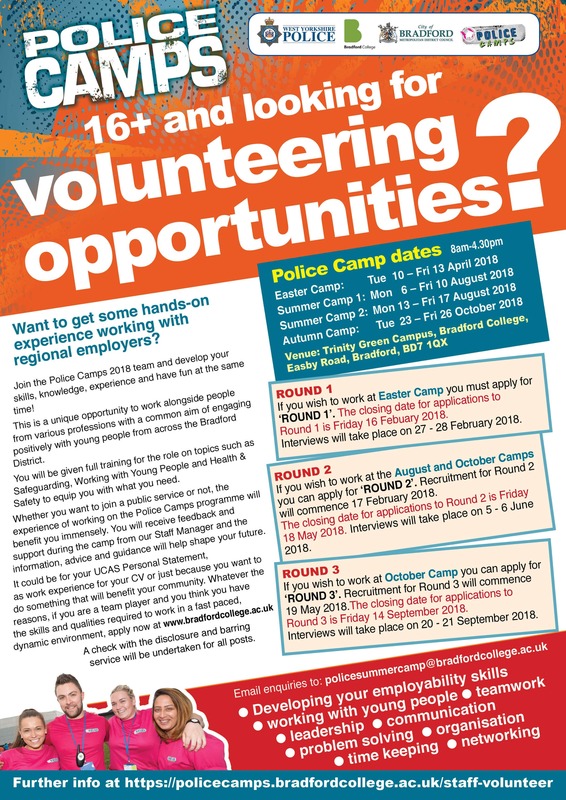 If you are working towards a career in Public Service or if you are looking to enhance your skills and experience by volunteering, Police Camp is a unique opportunity to work alongside people from various professions with a common aim of engaging positively with young people from across the Bradford District. All volunteers will receive training for their post including Working with young people and Safeguarding, this will be a one day refresher for returning volunteers and two full days for new volunteers this will equip you to work with us effectively. Whether you want to join a public service or not, the experience of working on the Police Summer Camp programme will benefit you immensely. You will receive feedback and support during the camp from our Staff Manager and the information, advice and guidance will shape your future. It could be for your UCAS Personal Statement, as work experience for your CV or just because you want to do something that will benefit your community. Whatever the reasons, if you are a team player and you think you have the skills and qualities required to work in a fast paced, dynamic environment, apply now! Please note a check with the disclosure and barring service will be undertaken for all posts. We are grateful to all the organisations that fund Police Camp and allow us to continue to deliver a safe and fun Police Camp Programme. We are looking for financial support, staff and organisations who feel their young people may benefit. Your support will not only facilitate the continued day to day activities but will help provide positive role models to youngsters in the region and will have a significant impact on your community. By supporting police camp you will be bringing people together and sharing your knowledge and experience, enabling the camp to expand its range of activities.